While it is hardly easy to find a common denominator among the works produced during this unfinished era of contemporary art, one of its distinctive characteristics could be said to be its tendency to benefit from major technological changes and from innovations in the research and development of low-cost synthetic materials. 1 This is so much the case that one can formulate the hypothesis that the history of technology, industrialization, and computerization of labor-related tasks, and, more broadly, the history of labor constitute the backbone of this period in the history of art. Thus, from matter to dematerialization and from heavy industry to Bitcoin mining, everything is but a question of one’s relation to things. Beyond the purpose for which they are handled, these work-related things—tools, materials, finished products—take on above all a social utility, as is shown in the works presented below: they are the prop for, as much as the peril of, social integration and social identity. This chronological and thematic journey across a selection of contemporary works will show along the way the changes in one’s relation to work-related things, from the mediating roles they can play up to and including their conflictual symbolics with respect to human agents. When mobilizing in their work efforts objects from the world of labor, numerous contemporary artists have brought to light a fundamental role played by labor: the elaboration of social ties. 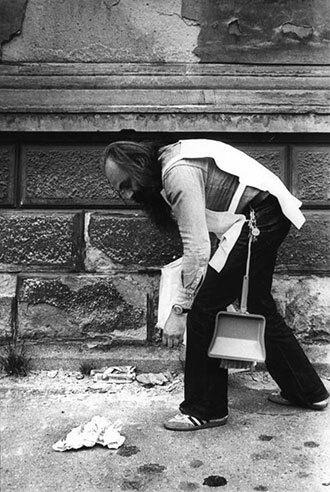 Thus it was with Tomislav Gotovac and Mierle Laderman Ukeles, who are practiced in the care of things: while the former did a performance involving a Cleaning of Public Spaces (1981), which resulted in a readymade composed of rubbish (fig. 1), the latter undertook to care for a museum and its works via the performance I Make Maintenance Art One Hour Every Day (1969-1980) (fig. 2). These two approaches rest on a valuing of things that is as much political as it is social. Gotovac brings to visibility the waste products of society left behind in the public space that come to affect this space designed for meetings as well as for the creation and maintenance of social ties; under the pretext of caring for a museum’s “artistic things,” Ukeles includes, within the public space of the museum, female domestic labor, which is usually confined to the private sphere. She makes palpable the invisible, gendered labor of care for things, 2 which is necessary to the “maintenance” of society, as well as the exclusion of domestic tasks from the spectrum of what is recognized as pertaining to a profession. These approaches involving the insertion of artists into the service area are full of examples that include transitive social objects. One can also take as an example Christine Hill, who created in 1995 her Volksboutique Franchise in the working-class Berlin neighborhood of Mitte (fig. 3). The project consists in the sale, by the artist herself, of low-cost, second-hand objects. The highly diverse objects of this Volksboutique are, for the artist, a pretext for working her way into the social fabric and for exploring its contemporary economic realities. Hill’s boutique truly is a boutique, with its real merchandise, and the artist genuinely lends herself to participating in the sales profession. Fig. 3 Christine Hill, Volksboutique Franchise, Berlin-Mitte. 1995 to the present. Installation, varying dimensions. As early as the year 2000, Mainz and Pollock pointed out two major sets of themes that run through representations of labor: the idea of labor as bearer of social identity and of labor as conveyor of social recognition. They did not yet know at that time that those themes were going to be able to apply to jobs in the field of digital technology. This is precisely what Andrew Norman Wilson shows in Workers Leaving the Googleplex, from 2011. He filmed a separate category of Google workers both male and female, identifiable on account of a colored badge, who have been assigned to digitalize books over staggered working hours. These employees are thereby unable to frequent the rest of the company’s personnel and are penned in in such a way as to render them invisible. Wilson underscores both the discipline of bodies and class contempt within the working-class world while showing how the work force is being replenished in the age of data work, with the disappearance of laboring bodies from the social space. Fig. 6 Stéphane Degoutin and Gwenola Wagon, Are you a Robot? 2015. Video, 2 minutes, 17 seconds. Excerpt from the film World Brain, 75 minutes. Courtesy: IRREVERENCE FILMS. Hidden within here is the idea of manpower itself being transformed into a thing. Thus, in 2015, the artistic duo of Stéphane Degoutin and Gwenola Wagon created the work World Brain. Among this series of video montages, one titled Are You a Robot? (figs. 5-6) was presented as a work in its own right at the 2017 edition of the Saint-Étienne Design Biennale. During the two minutes and seventeen seconds that video lasts, a dialogue is established between a male human being and a female voice from a call center trying to sell health insurance to her commercial target. The nature of this voice—whether human or the product of artificial intelligence—evades all clear-cut ontological categorization. And yet one is not mistaken to try to drive it into a corner: “Are you a robot?” is the nagging question the client shoots at his interlocutor. While she is able to state, “I am a real person,” the negative response, “I am not a robot,” will never be uttered. “The voice,” or rather the entity from which it emanates, could not reveal the origin of its vibrato. Is one dealing with a thing, or with a human being? The fear of reification, broached in Degoutin and Wagon’s work, testifies to the ontological jammings that seems to constitute one of the main themes of contemporary artistic production. For, while artists—those producers of things par excellence—have always put stock in things, both as sources of representations and as collectors’ objects, those female and male artists who make up the contemporary period reserve a special treatment for such ontological hybrids—for those quasi- or near-human things with which industrial civilization is ceaselessly confronted. BECKER, Howard Saul. Art Worlds. 25th anniversary ed. Updated and expanded. Berkeley, CA and London: University of California Press, 2008. BOURRIAUD, Nicolas. Esthétique relationnelle. 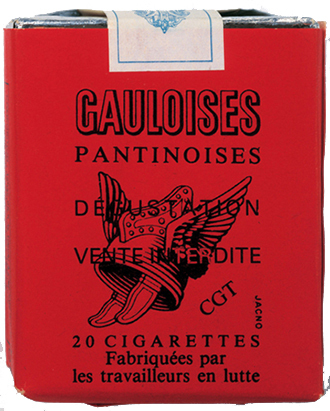 Dijon: Les Presses du réel, 1998. DURKHEIM Emile. The Rules of Sociological Method. 1895. Ed. with an Intro. Steven Lukes. Trans. W. D. Halls. New York: The Free Press, 1982. LATOUR, Bruno. Changer de société. Refaire de la Sociologie. Paris: La Découverte, 2006. MAINZ, Valerie, and Griselda POLLOCK. Eds. Work and the Image. 2. Work in Modern Times. Aldershot: Ashgate, 2000. MARTINI, Federica. “Art History Cold Cases: Artists’ Labour in the Factory.” Artnodes, June 24, 2017. doi:10.7238/a.v0i19.3099. A former student at the École Normale Supérieure of Lyon, Camille Richert is currently a PhD candidate in Art History at the Sciences Po History Center, where her dissertation work is being supervised by Laurence Bertrand Dorléac. Her research work bears on the representation of the gestures of labor from the 1960s to the present. Lecturer in Political Humanities at Sciences Po during the 2017-2018 school year, she is also in charge of and the pedagogical tutor for the 9th edition of Sciences Po’s Contemporary Art Prize.